Meet the Wild Jester on Jackpot Jester 50k slots and stand the chance to pocket a massive win of 50,000 coins when all the wilds are stacked on the reels! 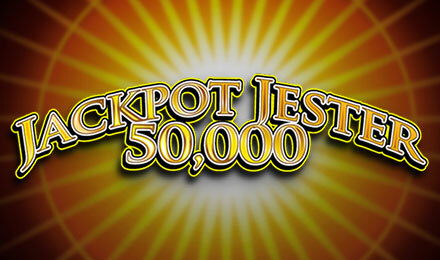 Jackpot Jester 50K is a classic 3 reeler slot game with an ambient Las Vegas atmosphere. Entertain yourself on the lively slot game which features the classic slot symbols such as bells, cherries, lemons, lucky number seven, jesters and more! Win up to 50,000 coins on the 5 payline slot game with the Bet10 or Bet20 options which accumulates wins for the Super Game slot reels. Find the Wild Jester stacked in the Super Game that will up your wins and give you ultimate thrills!